Namibia’s National Parks: Where Do All the Skeletons Come From? We kneel down at the front entrance to the building of the Mayuni Conservancy Traditional Authority as instructed by our guide, Geoffrey. “Clap clap clap, clap clap clap” – we heed the traditional custom of clapping our hands in a kneeling position, asking for permission and goodwill to enter such an auspicious place. Once welcomed in we repeat the performance right outside the office of the man we have ventured here to meet. No sound comes from within, but with the custom upheld and no sign of rejection, we are granted entry, a warm welcome and a collection of wonderful tales awaiting us inside. And so my most fascinating interview to date commences… it’s not every day you get to meet a chief. Vervet monkeys outside our tented suite are chanting their “good morning” wake-up call. The sun is just peeking through the canopy, rays of orange and pink hues announce the start of the day here in paradise. Our early morning welcoming party at the lodge’s main area comprises Armstrong, Lydia and a freshly brewed French Press. Smiling faces, courteous and friendly “how was your night’s rest” enquiries, a wonderful start to the day and another delightful visit to Nambwa Tented Lodge. On a breakfast boat cruise we chat away with fellow guests and are regaled with stories from our skipper and guide, Beaven. This is not my first visit to Nambwa and will certainly not be my last, so it feels like chatting to an old friend as Beaven and I catch up on how his family is doing and how things are faring in this beautiful corner of the world. As true Namibians do, we commiserate with each other over the rains and the resulting animal movements. An afternoon game drive with Eustace, the lodge’s other guide, yields the same sense of welcome familiarity. This is their home and they have an uncanny ability to immediately make you feel like a treasured guest, not just someone passing through. On a recent adventure to Nambwa Tented Lodge I discovered a new sense of recognition for what makes a place such as this truly special. What makes it stay with you, engrained deep in the fabric of your soul long after you’ve made your journey home? All the usual characteristics are there: the location and scenery are utterly spectacular, the floodplains and bushland wilderness of Namibia’s Zambezi Region so different from the rest of the country and completely beguiling. The wildlife puts on a show: impala, kudu, red lechwe, bushbuck, buffalo, hippo, crocodile, wild dog, huge herds of elephant and and and… The lodge itself so skilfully and tastefully blending in with the natural surroundings, magically creating a luxurious ambience while still somehow making you feel right at home. And therein lies the crux of it. Home. There’s something to this forest retreat that inspires a sense of comfort and belonging like few others have the capacity to do, and on this latest visit I believe I’ve finally found the source. It’s the people who welcome you. The people who make you feel like they’re welcoming you home. The children from the local village enjoying our visit. Guide Beavan Kanzeka (right), and guest, Danielle Labuschagne wearing a flower necklace traditionally made for an engaged woman. “Emotion becomes the fabric of a lodge”, Tinolla Collins once told me. She and her life partner Dusty Rodgers are the owners of African Monarch Lodges, which comprise Nambwa Tented Lodge, adjoining Nambwa Lagoon Camp as well as their sister lodge, Kazile Island Lodge, the only accommodation establishments within Bwabwata National Park. Emotion lies at the core of it all, and it is the people that create these feelings and the atmosphere of a place. After all, home is where the heart is, and the staff are at the very heart of Nambwa. Having met, chatted and bonded with the Nambwa family (because that is truly what they are) I noticed a very important common denominator: they are all local, and all intrinsically understand and reinforce the value that tourism has for the local communities in the region. I became so enthralled with this sense of community and understanding that I enquired whether a visit to a local village would be within the realm of possibility. “Of course!” was the answer, and so it happened that I and my travel companions had the pleasure of being invited into yet another ‘home’, where we not only met charming individuals, but had the opportunity to make a host of new friends. A small plume of dust signals his arrival as we wait on the shores of a Kwando tributary. Children’s laughter reaches our ears from nearby. After spending days secluded inside our bush retreat in Bwabwata National Park it’s strange to realise that civilisation is nearby. That’s why they call it “the people’s park”. Wildlife and humans need to co-exist here, make a home for themselves and find a balance and the harmony in which to thrive. That’s one of the many reasons why our host for the day, Geoffrey, has come to fetch us on this riverbank. Geoffrey Tukuhupwele, who works for the Ministry of Environment and Tourism as a key part of the region’s anti-poaching operations, is a well-respected and much-loved member of the community here. I see it in the way everyone waves and greets him as we pass through small settlements. We stop at villages, meet his friends and family. We play an animated game of soccer and are blessed with not one, but two impromptu concerts as the energetic youngsters sing for us while jumping around in a circle resembling a “ring around the rosy” game. At another village we launch the drone we have brought with us. The children laugh, shout, run and wave at this “tiny helicopter”, as they call it. Never before had they seen such a thing, and the experience is equally special to both the audience and us, the pilots. Chief Mayuni, the traditional chief of the Mafwe tribe. Nambwa guests and children playing soccer. Children from Geoffrey's home village facinated by their first experience of a drone. It’s a simple life here in the Zambezi, but one full of laughter, where the slow pace of the African way of life mirrors the rivers running parallel to it and leaves a sense of peace with you as visitor. Both an eye-opening and heart-warming experience. Food for thought and the soul. And so we moved on to the true purpose of our community visit… At the offices of the traditional authority, after showing our respect for local cultural rituals, I have the pleasure of sitting vis-à-vis Chief Mayuni, the traditional chief of the Mafwe tribe. A well-spoken, eloquent gentleman, the Chief regales me with stories of the past and present, helpfully translated by Geoffrey. The Chief relates how he first met Dusty, of whom he had heard before their meeting, referring to him by his local nickname: Captain Caprivi. “In 1997, Geoffrey and I went to Impalila Island to meet Dusty Rodgers,” says the Chief. 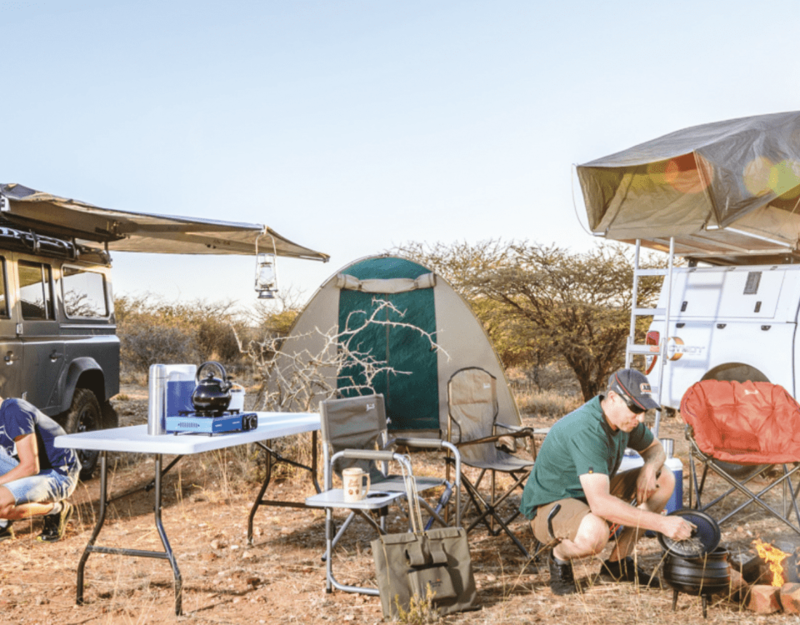 And so started a success story, which now already spans over two decades, in co-operation between conservancies and what would become African Monarch Lodges. I enquire about the Chief’s personal opinions on tourism practices and the benefits that reach the community. “I have been advocating this since the early nineties!” he emphasises. Long before such practice was common, Chief Mayuni supported and advocated the direct positive influences that lodges and operators could have on locals. Job creation, education, training and the critical role which the mere presence of such entities plays in conservation, he says, are at the forefront of these advantages. He reiterates how every member of his community should fully understand how this balance of community, tourism, private-public partnership and conservation can support one and all. Cultural villages, like the one donated by African Monarch Lodges near Kapaku, are an ideal and effective platform for locals to not only showcase their products and skills, but also promote cultural tourism as a revenue source. The Mafwe Living Museum is another example of the socio-economic benefits that can be derived from this growing industry. Today, African Monarch Lodges recruits almost exclusively from nearby villages to staff its facilities. These ‘AML family’ members have a deep sense of pride in what they do and where they do it. This pride shines through their smiles and is obvious in every conversation I have had with them. What a wonderful feeling to be surrounded by people who find joy in their work, love sharing this joy and their culture with you and make you feel as if some of it has rubbed off on you. Upon our departure no-one says “goodbye”, but rather “see you soon”. Never has a farewell felt so much like a hello. At Nambwa and in the communities we were so fortunate to visit, every greeting feels like a “welcome home”… I’ll clap to that.